Forms can hold a lot of visual weight and still physically be balanced. The illusion of an unbalanced object creates the facade that the object is defying gravity. Beginning by analyzing three paintings by Lazar Markovich Lissitzky through iterative sketch diagramming. 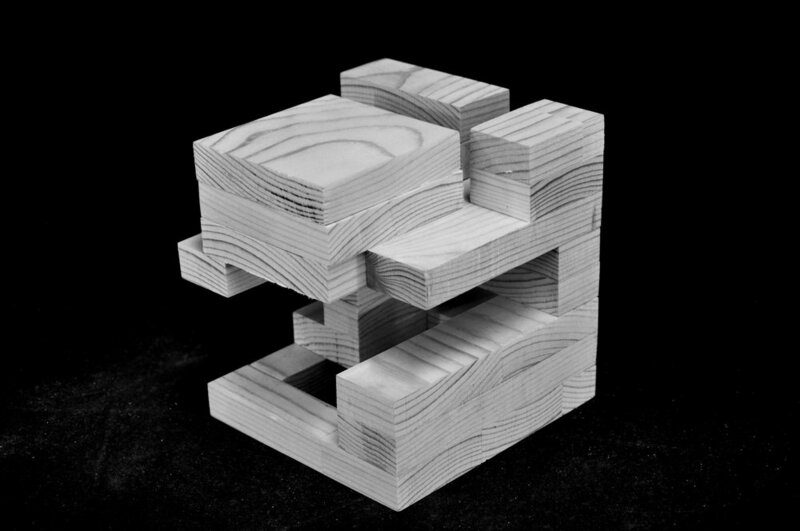 Choosing one painting, analysis and interpretation helped evolve the design from two-dimensional, free-hand diagrams to three-dimensional massing models constructed of stacked cardboard and finally to a final form cast in plaster using stacked cardboard form work. Sketching, diagramming, and orthographic drawing was key throughout the process: working back and forth between 2D drawing and 3D modeling helped to define and develop the formal composition of this interpretation. This project taught me to value the study and development of a design. About 60 diagrams into the 99 I would draw, I realized the reason drawing so many diagrams was important--it helped me to hone in on the most important elements. I found that I gravitated to the artworks most fundamental, and underlying components that I never would have picked up on had I done 10 diagrams or even 30. I think my project was successful for this very reason. I simplified the painting to what I felt was its most basic structure, and that’s the diagram I went with for my 3 dimensional design. By creating a forced perspective, the viewer is compelled to look at the object differently than they naturally would. Each person will receive a 4’ piece of 1x4. Your entire cube will be made from this piece, so you must consider the most advantageous way to cut it into pieces for assembly. You must use the entire piece of wood. All cuts and joinery must be 90º. Focusing on the difference in end cuts and side cuts, the stacked layers are assembled in such a way that they appear to be striped. This was my first time ever working with wood, and it was great learning how to plan out, and execute my cuts in the shop. 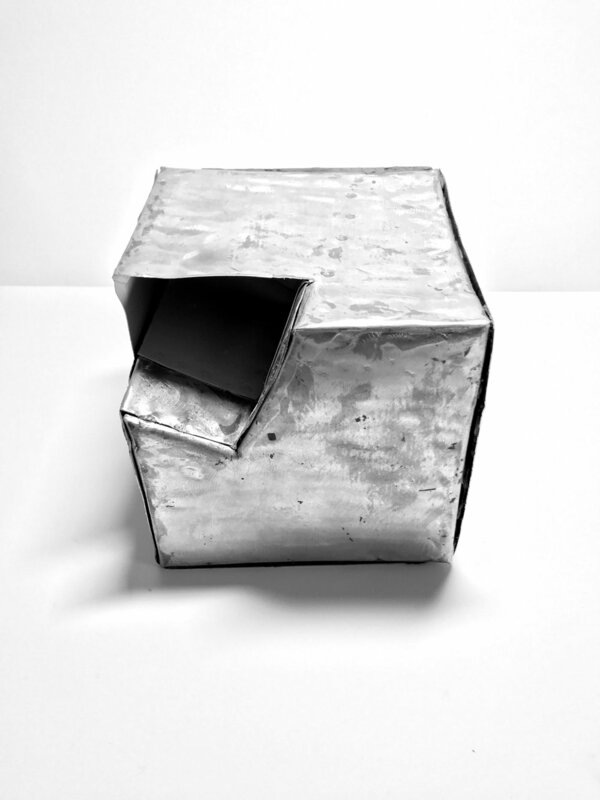 My cube is successful because the open voids draw the viewer through the piece, causing them to want to pick it up and turn it around to see all perspectives. I would love to do this project again, but in another iteration there is one thing I would definitely pay attention to--to save myself time and energy. Form follows function. That rule was illustrated loud and clear with this project. My concept was to create a forced perspective [pictured best on pg. 13] through one of the sides of my cube. I spent hours planning how to utilize the different end-cuts and side-cuts to have my finished cube look striped. Once the cube was complete and I was ready for the final review I noticed that while it may look cool, the stripes did not further my concept. In the future I would utilize my end-cuts and side-cuts to draw the viewer into my forced perspective rather than just creating something ornamental. CUTTING PLANES Cut planes perpendicularly on a slanted axis. Overlap cuts from different sides to create reliefs in the cube. SEAMS Used only lap seams to not complicate the design which already draws attention to the reliefs made by the intersecting cuts. COLOR White used on the “interior” of the object to draw the viewer in. You will use 2 dimensional patterns to construct representations of geometric primitives. You will learn about various methods of constructing seams, and use them to emphasize or de-emphasize characteristics of these shapes. You will translate these ideas into sheet metal models. This project taught me how to use Rhino, create patterns, and work with metal. I really learned the value in creating a model before jumping to the final piece. Unfortunately, I learned this the hard way. 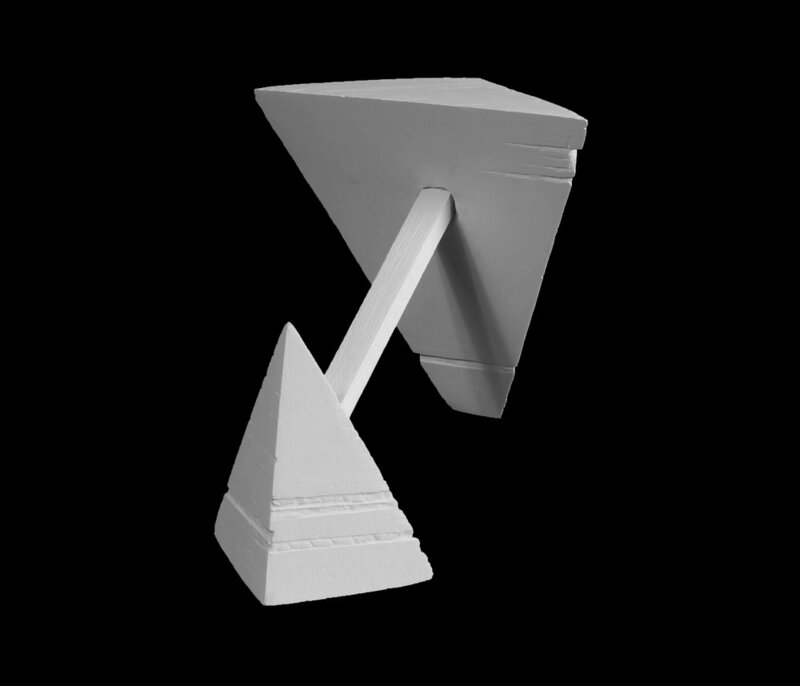 My first iteration was a tetrahedron [model pictured. When I changed my mind and decided to go with a cube instead, I figured that a pattern made on Rhino would be enough to guide me through the process of building the cube--I was wrong. I spent much more time working on this project than I needed to because I skipped such a fundamental step. Even though I was lucky enough to have my model still turnout well, if I were to do this project again I would most definitely build a study model to work out the kinks in the project before heading into the shop.